Tens of thousands of scientists signed a petition agreeing that there's no evidence of catastrophic climate change. Who should you trust about climate change? Climate experts? Or veterinarians and electrical engineers? The agreement among scientists about human-caused climate change is very strong. It is rare for scientists to be in such a strong state of agreement. In fact, by multiple measures, 97% of the most active climate scientists agree that humans are causing significant climate change. 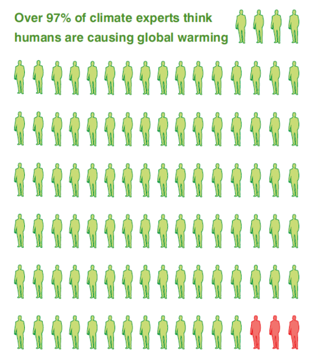 Figure 1: 97% of climate experts agree that humans are changing the climate. © John Cook. One study, completed in 2008 and published in 2009, classified the respondents by their level of expertise. What they found was not surprising. The more people know about climate change, the more likely they are to understand that humans impact the climate (Figure 2). Figure 2: Graph showing how greater expertise leads to greater understanding of human impacts of climate change. From P.T. Doran and M. K. Zimmerman, Eos, Transactions American Geophysical Union 90, vol. 3 (2009): 22. doi:10.1029/2009EO030002. A second study used a very different technique yet came to the same conclusion. So, why is there such confusion and where do people get the idea that there is still a “debate” among scientists? The answer is, the confusion has been manufactured. Groups like the Oregon Institute on Science and Medicine (a fringe group with little climate science background) have helped to fabricate a debate. About a decade ago, this organization began the “Oregon Petition Project” with the assistance of climate denier Frederick Seitz. While Fred Seitz was already well known for his role funding studies to create doubt regarding tobacco impacts, he had turned his attention to global warming. He, and the Oregon Institute, sent letters to thousands and thousands of people with B.S. degrees, regardless of whether they were in the climate field. They asked the recipients to sign a petition against taking action on global warming. 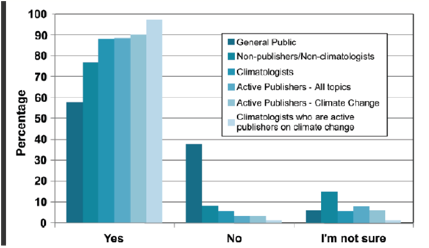 Finally, less than 1% of the signers are climate scientists or atmospheric scientists. So, we have shown that while the vast majority of experts know that humans are causing the climate to change, a small but well-organized effort has tried to keep that information from the larger public. We experts know that while the coming climate change will present some hurdles, it is also something that we can tackle with today’s technology. If we act quickly we can not only improve the climate and safeguard this planet for the next generation, but we can build the new economy with clean and renewable energy. Who can be against that?